What kind of meals should I feed my cat? Cats are very unique, mysterious, stealth, exotic creatures with very different genetics than any other creature on earth. They are hunters, an obligate carnivore that require a supply of fresh meat and fish to maintain optimal health. Our domestic cats are descendents of African wildcats. As we know, all animals have very specific nutritional requirements for different body functions. These nutrients are normally available when they eat a species appropriate diet. As descendents of a desert animal, cats require food as their source for dietary hydration. Nowhere in nature do you find any creature eating a processed food that has artificial colors and flavors to make it palatable. Nowhere in nature will you find foods that require added vitamins and minerals in order to make the animal stronger or healthier. If you walk down the cat food aisle in your local supermarket or pet food store, you rarely see a food that meets the nutritional requirements that our cats need. You will see fancy packages of dry kibble with pictures of everything from mountain lions to Persian cats along with images of fresh ingredients such as fish, chicken breast, eggs and vegetables. When you open that package, do you see or smell that fresh meat and fish? Why does an obligate carnivore need vegetables? 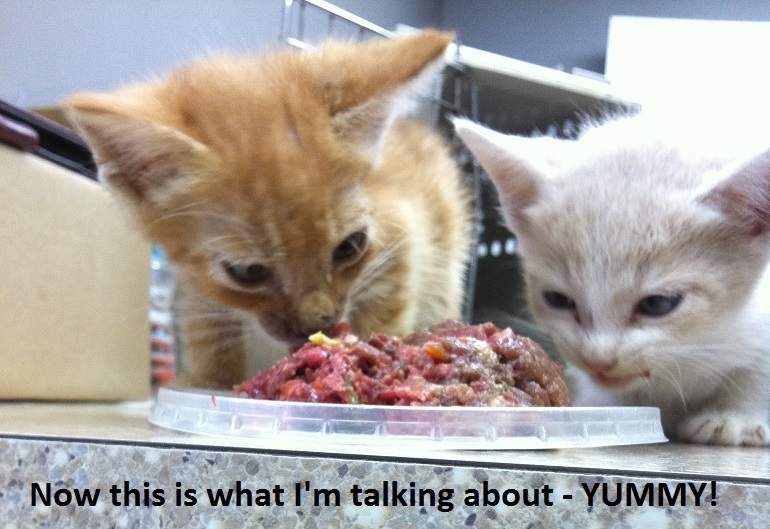 Where in nature do cats eat vegetables or dry, highly processed cooked food? At the store you will find an overabundance of canned and pouch foods that, while providing the moisture and hydration requirements, are still highly processed, cooked and full of fillers. These processed foods also contain a long list of chemical vitamins, minerals, colors, flavors, preservatives as well as processing chemicals. Many of these products are labeled “natural and appropriate” as well as complete and balanced. Are any of these ingredients truly natural as they should be if found in nature? Where would you find a natural “flavor plant” or “vitamin tree”? Do felines stalk, kill and eat wheat or corn plants? I am being facetious here. The following is actually content from a top veterinary brand label; “Whole Grain Wheat, Corn Gluten Meal, Pork Fat, Powdered Cellulose, Pea Bran Meal, Dried Egg Product, Wheat Gluten, Dried Beet Pulp, Chicken Liver Flavor”. Do these ingredients sound like carnivore appropriate foods? There are many health challenges experienced by our felines when fed an inappropriate diet such as urinary infections, crystals and bladder stones, diabetes, cancers, irritable bowel, skin and dental issues, as well as allergies and skin problems. In a truly wild state these health challenges are unheard of. Research and scientific studies confirm not only that improper nutrition contributes to all of these conditions, but that also switching to a biologically appropriate diet provides the cures. We must remember that our cats are desert creatures and should never be given a dry kibble diet. Their food always needs to be wet. As an obligate carnivore, it must acquire animal proteins and fats from fish, meat, poultry and eggs. It should never be left out as free choice but fed as a meal and removed when they are done, similar to what they would do in nature. The foods also need to be rotated with different varieties daily to provide the natural balances of a dynamic being. ← Is My Pet Normal Or Sick? it is first necessary to understand what cats need in their diet. I read your all the stuff and found it interesting. Thanks for sharing.